WAIST HIGH: Happy 25th Birthday Once Upon A Time. Happy 25th Birthday Once Upon A Time. The ninth studio album from Simple Minds, Once Upon a Time was released immediately after the worldwide success of "Don't You (Forget About Me)," a song that at the time was a sort of mixed blessing for the band. "Don't You (Forget About Me)" went to #1 around the world and finally broke the band in the United States and although the band "were certainly happy to reach the top of the charts with that song, it's clear that their ultimate aim (was) to succeed here (U.S.) with their own material as they have everywhere else in the world." Reportedly first offered to Bryan Ferry, Simple Minds initially refused the Keith Forsey/Steve Schiff penned "Don't You (Forget About Me)," and continued to distance themselves from the song during the rest of 1985; refusing to include it on Once Upon a Time. Four singles were released from Once Upon a Time, "Sanctify Yourself," "Alive and Kicking," "Ghost Dancing," and "All the Things She Said." "Right from the ringing guitar and synth salvos that introduce the title track, Once Upon a Time resonates with the charged assurance of a group that knows it's firing its best shot. All the signature elements of its sound - carefully stacked keyboards, sweet, stinging guitar lines, shrewd manipulation of dynamics and space, a sensitive but driving beat - seem sharper and fresher than ever before." 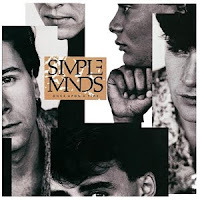 Simple Minds at the time of the recording was Jim Kerr, Michael MacNeil on piano and synthesizer, Charlie Burchill on guitar, Mel Gaynor on drums, John Giblin on bass, and Robin Clark on those beautiful backing vocals.